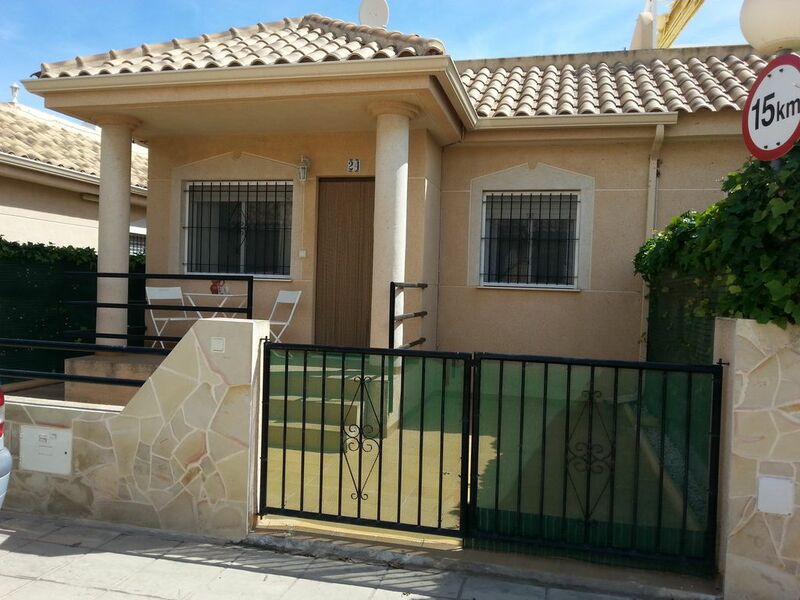 This lovely bungalow is situated within the quiet and pretty Campo-mar residencia, in the popular resort of La Zenia. The living accommodation which is on one level offers bright lounge/dining room, separate kitchen, two twin bedrooms and family bathroom. The entrance sun terrace, which is gated, provides table and chairs to perhaps just relax in the warm evening whilst enjoying a long cool drink. The roof solarium receives the sun all day and provides sunbeds so that you can enjoy sunbathing in the warm sunshine. A small coal bbq is also available for use. Again, table and chairs are provided. For entertainment value a satellite tv system showing all mainstream channels is installed, so that you may catch up with your favourite programs whilst on holiday. Wifi is offered free of charge for those guests who like to ´keep in touch´. All local amenities are within a short walking distance, making this an ideal holiday home for families, couples and friends. Wall mounted heating panels in lounge and both bedrooms. Mobile gas fire. The air conditioning unit will convert to heat. All beds are freshly dressed each changeover. *An 80ltr water boiler is provided, ensuring ample hot water is supplied throughout your stay. *Two clothes air dryers are supplied, one portable. *Should you require a cleaning service during your stay this can be arrange, at extra cost. Please enquire. *Depending on your needs we are happy to supply you 2 sets of keys. Georgina Matravers who helps instentaneously if need be. I should add that we are two people. For more people another IKEA chair may come handy. The only negativ aspect would be my inability to deal smartly with the HomeAway IT-system.My fault ? On the first morning we were woken up by loud drilling and banging from the villa behind us. I walked around to see what was going on, to find they were renovating a villa and they'd been doing it for some time by the look of it. Every morning we were woken up by this unbelievable racket at around 8.15am, so no chance of a lie-in. It continued throughout the day for two weeks and ruined our holiday. I know the reply is likely to say that they didn't know about it, but that work had not started overnight. Additionally the neighbours were also doing the odd bit of work when they weren't banging doors and their dogs weren't barking. I really like La Zenia but no-one could possibly enjoy a holiday with all that deafening noise going on and it wrecked it for us. It was so very unfortunate that during the period of this booking two of the nearby houses were undergoing home improvements. It is most certainly appreciated this will have had a impact on their stay and of course we were sympathetic. This is a very established urbanization and occasionally home owners will want to do home improvements. Unfortunately this is neither avoidable or foreseeable. In relation to the property itself, the guests advised that aside from the noise nearby, they found the bungalow to be clean, comfortable and conveniently close to local amenities comfortable. The one star rating therefore would appear to relate to the noise and not the bungalow itself. We have been going to La Zenia for years and found this year that this location is perfect. You are in walking distance to lovely bars and restaurants. You are in the middle of everything so in one direction its a short walk to the beach and in the other direction its a short walk to the shopping centre, where you have a huge variety of shops, bars, restaurants and depending on the time of year there would even be shows. What i loved about this bungalow is the sun terrace and the view from it, it was ideal if you wanted a peaceful afternoon to lay out in the sun. I would definitely recommend this bungalow and i will definitely be coming back. Absolutely delighted you enjoyed your stay at the bungalow. La Zenia is heart of the Orihuela Costa and the location of the bungalow makes it an ideal holiday home. We look forward to seeing you again in the future. Best wishes. great location, handy for the beach of la Zenia and perfect for those who like to eat out whilst on holiday, bars and restaurants are just a 5 minute walk away. The villa is spotlessly clean and very well maintained, I would definitely recommend to friends and family. Nice clean property,good sunroof for sun lovers.Georgina was very easy to deal with and the property is in a very central area.Close to La Zenia boulevard and beach,plenty of good restaurants nearby. It is with great pleasure that I can review this property .From the initial inquiry the whole way through to the final booking was seamless and dealing with Georgina was a pleasure reply's to emails were quick and by the time we got to our departure date we had every confidence that there would be no unexpected hiccups.We are already planning to go back again in September and may stay for two instead of one week. We stayed at the property from 28/4/2018 till 5/5/2018. We are delighted to know your stay at the bungalow was enjoyed and your booking process was smooth. This is our aim. Thank you for your review. The five resorts along the beautiful stretch of the Orihuela Costa boasts Punta Prima, Playa Flamenca, La Zenia, Cabo Roig and Campoamor. La Zenia itself is in the heart between the popular Playa Flamenca and the vibrant Cabo Roig and provides very easy access to the both the AP7 (Autopista) motorway and the N332 coastal road. With much to offer, La Zenia is a popular resort and only 10 minutes walk to its three beaches, all with good facilities. The village itself offers bars, restaurants, shops, a choice of 4 large supermarkets, banks, bars and restaurants and an abundance of entertainment. Only a few short minutes walking distance between the Saturday street market and the AP7 Junction is the Zenia Boulevard commercial centre which boasts over 5000 car park spaces, over 150 shops including Zara, Guess, Primichi, Amichi, Blanco, Primark, Mundomar, H&M, Cortefiel, C&A, Druni, Decathalon, Leroy Merlin and Al Campo hypermarket just to name a few. For entertainment value there is a large play area for children, a bowling alley and casino. On the forecourt the grand tv screen is often showing sports, children's interactive games and music videos. There are many restaurants, cafes and bars to enjoy a snack, lunch, dinner or an evening out whilst enjoying the live entertainment provided on the plaza. The centre itself is a pleasure to walk around if only for window shopping (if possible), a bite to eat or a refreshing drink. A good night out is guaranteed during the months of July and August as the centre is open until 1am. Other local activities are football, bowling, 10-pin bowling, go-karting, scuba diving, tennis and cinema. Beaches: There are many beautiful beaches along the Orihuela Costa, the majority having been awarded the blue flag in recognition of safety and cleanliness. Campo-mar residencia is just a short walking distance to the fabulous beaches of La Zenia and the beaches of Campoamor, Cabo Roig, Levante and Cala Capitan are just a little further along the coastline. The main town of Torrevieja, once a fishing port, has many lovely restaurants and coffee bars, fabulous marina, promenade, shopping centre, water park and much more and is only a 15 minute drive away. Every evening during the high and mid seasons you will find an abundance of small market stalls providing local craft along the front. Should you wish to venture further afield then drive south along beautiful Mar Menor coastline which stretches from San Pedro to La Manga. Alternatively heading north towards Alicante you will find the very attractive sandy beaches of Guardamar and La Marina and other resorts definitely worth a visit. Airlines: including Monarch/Rynair/Easyjet/Jet2/British Airways offering scheduled flights from Stansted, Gatwick, Luton, Glasgow, Edinburgh, Prestwick, Belfast. Dublin, Cork and many other major European airports. Airports: There are two main airports serving the Costa Blanca area and these are Alicante, which is just a 45 minute drive to the property and just 20 minutes drive away is the smaller Murcia (San Javier) airport. Transfers: Airport transfers to and from both Alicante and Murcia (San Javier) are offered. Prices on request. Golf: Just a short drive from the property are the superb golf courses of Villamartin, Las Ramblas and Campoamor and now, within a 20 minutes drive there are a further 8 golf courses for your enjoyment.